What a goal by Bradders! It's also in the 'Kossy' thread but for anyone who hasn't seen it, courtesy of FleaTV here he is scoring the winner today. Accompanied by an irate woman if watched with sound! Today's random image is from the 13th September 2008 Town (in yellow) travel to Ryton in the FA Cup 1st Qualifying Round. Today's random image is a stub from the 2003/04 season ticket! Today's random image is from the 6th October 1984. The Shaymen visit White Heart Lane (wouldn't mind Town drawing Spurs in a cup to visit their new stadium!) looking to overturn a 5-1 deficit on the Milk Cup. They didn't and lost this this tie 4-0! 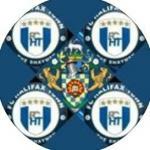 If we signed one of Duku or Rodney we are all aware they'll be hit by the 'Halifax Town' curse don't we? Season ending injuries? Today's random image is from the Salford City Home game (12/12/2009) and shows Nick Gray just about to score vs Woodley Sports the previous home game (28/11/2009).